my favorite rain jacket is on sale at penfield. the gibson. sizes and colors are limited, but it’s marked down from $160 to $96. that’s a steal. i have the navy. i ordered one in olive. it’s pretty much the only rain jacket you’ll need all summer. adidas rod laver tennis shoes might be my favorite tennis shoes of all time. i’ve run through close to 3 pairs. that might not sound like a lot, but i bought my first pair when i was a sophomore in college. that was forever ago. rumor has it they’re reissuing the original shoe from the 60’s. this is good news because 2 years ago they added a new outsole that increased the weight of the shoe about 20 pounds or at least it felt like it. the reissues were supposed to be on adidas.com on thursday, but i didn’t see them when i just checked. i will continue to check back until i get these shoes. they will be mine. oh yes they will be mine. the other day my brother-in-law asked me for recommendations on a dress shirt. the only one that came to mind was ledbury. since i discovered ledbury, i haven’t bought anything but. i had a lady come to my office and try to fit me in one of those made-to-fit brands and i told her it would take an act of congress for me to change brands. i believe as you get older, you find brands you like and you stick with them. my dad doesn’t buy anything but polo and brooks brothers. it works for him. in my limited time on this earth, i’ve found that ledbury dress shirts fit me the best. one way i can tell they’re working for me is from the amount of compliments i get when i’m wearing one. the blue shirt with the navy dots in the top right of this post averages 3 compliments per wear – true story – and that makes me feel good. 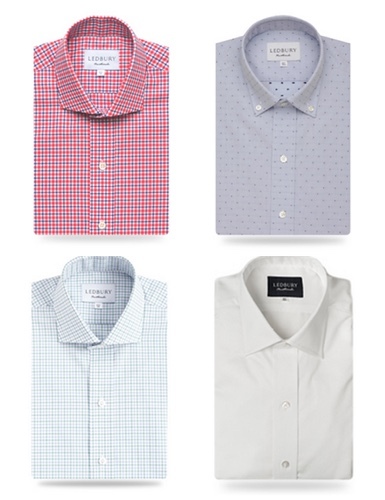 i’m not saying you should only buy ledbury shirts from here on out (you can if you want to). what i’m saying is that when it comes to something as classic as a dress shirt, find a brand or two that you like and stick with them. and be sure to buy quality, because they’ll last a lot longer. if you’ve been sleeping under a rock and would like a little more info on ledbury, click here. or if you want the cliffs notes, here you go: great story. great brand. great price. great quality. editor’s note: my father informed me last night that he now only buys ledbury shirts. my apologies to brooks brothers and polo for the misinformation. sorry for the lack of posts this week. i’ve been out of town. i got back from vegas late monday night and then went down to augusta for a couple of days on tuesday. i’ve been recovering ever since. 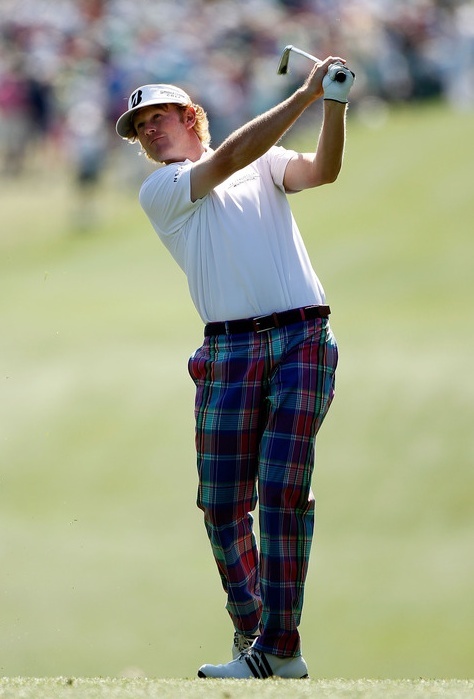 esquire has posted a list of the best and worst dressed players at the masters. i was pleased to see that my buddy brandt made the cut. he signed a deal with peter millar last year to keep him looking fresh on the course. rumor has it, he wore a pair of pink and white plaid pants today. it must have helped his game, because he posted a 68. i’ll post a pic as soon as i can find one. found one (below). not quite the rumored pink and plaid i mentioned earlier, but definitely easter appropriate. good luck tomorrow, sned. i’m rolling out a new feature on to take the train called “women we appreciate.” it’s more or less an excuse to post a few pictures of well…a woman we appreciate. first up is hunger games star jennifer lawrence. she may be only 21, but she’s one of the most talented young actresses in hollywood (see 2010’s a winter’s bone). the hunger games isn’t out until next friday march 23, but in the meantime enjoy a few tasteful pictures of the beautiful jennifer lawrence. i hate stealing a whole article from esquire, but this is too good to pass up. i couldn’t agree more. One of the things we look for in our actors is a guiding light — the ability not just to dazzle onscreen but to blaze a path, stylishly or otherwise, when they’re walking the red carpet, or appearing on talk shows, or, you know, taking the kids to the grocery store. It’s what makes paparazzi photos tolerable for men: you can at least hope there’s something to learn there. Guys like Johnny Depp, as we’ve known for years, and Chris Hemsworth, as we found in our pages a few months ago (and as America discovered this weekend), have that kind of appeal. 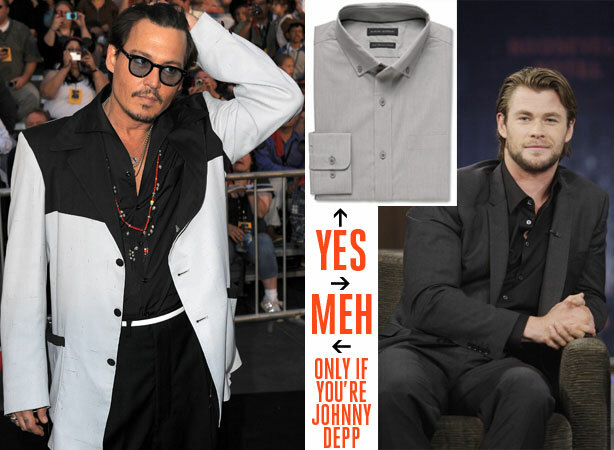 But before you get too inspired by their wardrobe choices in public over the weekend (Depp at the fifth Pirates premiere, Hemsworth on Kimmel), a word to the wise: avoid the black shirt. For whatever reason, the black shirt has become something of a staple for men in the limelight. Which is fine, except that it just gets lost in translation when attempted by civilians — somewhere in the waiter zone. Not that there’s anything wrong with that, but let’s just say (once again) that the creations of Johnny Depp are best left in experienced hands. So if you want an alternative option to white or blue this summer, consider the gray dress shirt. Not only does it look cool, but it’ll go with all your suits: charcoal, navy, and black — a black suit, that is. i guess i can live with the gray dress shirt (if you must), but please don’t ever wear a black dress shirt. 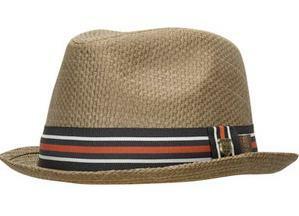 save that look for the dude that works on the computers at your office. them altered, as shrinkage can occur in the wash.
store that information away for the next time you visit a new tailor. it’s taken me 4 pairs of ruined jeans and 4 new tailors to find one that understands the “european hem” because i didn’t know how to explain it.